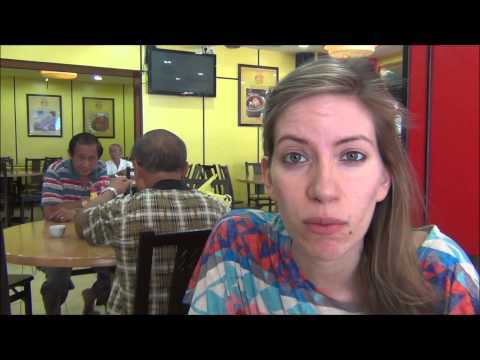 In our latest travel video we sit down for a cup of tea and noodles at one of favorite restaurants in the Chinatown district of Kuala Lumpur to discuss and review our one month experience of traveling in Malaysia covering Malacca, Penang, the Cameron Highlands and Kuala Lumpur. We start off by discussing our favorite destinations, food and modes of transportation which are respectively Malacca, dim sum and train rides. We indicate Chinatown as being a great budget option for accommodations in Kuala Lumpur and break down our daily budget which is roughly 150 ringgit per day for the two of us combined while offering some budget travel tips, such as eating street food (Cendol and others). We have spent an entire month in Malaysia – 29 days – and we’re coming to the end of our trip here. I guess we’re just going to share some of our thoughts. We are here at the restaurant Chinese Pavilion, one of our favorite little spots, here in Kuala Lumpur. This is just a place we’ve come to have some noodles and some Chinese tea for lunch. Your favorite place in Malaysia? My favorite place so far in Malaysia has been Malacca. I thought it was a nice little introduction to Southeast Asia. It is a very easy city to navigate and it is very cute with its red paper lanterns and lots of great food. That was my favorite. Your favorite dish? That is an easy one. I’ve been feasting on dim sum almost everywhere I’ve gone from Melaka to Penang and even back here in KL. It’s all about the dim sum early in the morning. Waking Audrey early to get out of bed. Yeah, at ridiculous hours like six in the morning to go eat breakfast. One of my favorite things to do. Lowest point of the trip? Again, that is quite an easy one. After leaving Penang we went to the Cameron Highlands hoping for a nice hillside retreat but instead what happened was we got booted out of our hotel and there was nowhere else for us to stay unless we were willing to be exorbitant fees and we weren’t. We had to hightail it out of there. Yes, so we spent two days in the Cameron Highlands – more like a day and a half – and we unfortunately didn’t get to see any of the main attractions because we took a day off expecting to be able to do something the following day. Instead we had to scramble to come to KL. Whoops! Many first travelers to Malaysia land in the capital KL. Where would you recommend they stay for budget options in the city? I think most of the budget options are in Chinatown, so I would suggest finding a hostel in that area. We’ve been paying about 40 Ringgit, which is just over $10 USD for two people and we’ve been getting a pretty decent space with wifi. That is my tip – go to Chinatown. Your favorite way to travel? That is again a very easy one. Taking the train was by far my preferred method of transportation while in Malaysia. The only actual train journey we took was from KL to Butterworth up in the north but it was just a lovely gorgeous journey. We were passing through all kinds of diverse scenery and the seats were comfortable. The train wasn’t crowded and it was almost a bit like a family atmosphere. We had little kids running up and playing with us. It was just an awesome journey and we saw scenery we wouldn’t have otherwise seen had we of taken the bus. So for those looking to save a bit of money with their food while in Malaysia what do you recommend? I would recommend eating lots of street food. One of our favorite dishes of mine – that I’ve tried – is called Cendol. It is basically a really refreshing dessert. You get a bowl of shaved ice and they pour coconut milk and palm sugar over top and it also has kidney beans, rice but it was very refreshing. How much was that? I think it was less than 3 Ringgit wasn’t it? In other words, less than $1 USD for a refreshing treat. You can find that in restaurants and you can also find that just right out on the street with people making it with special kinds of ice machines – shaved ice machines. Exactly! So we’ve been traveling here for a month. What would you say is a good monthly budget to have? Well, Malaysia is one of the more expensive SE Asian countries; however, the budget we had set for ourselves we haven’t been spending on a daily basis. We had given ourselves a budget of a hundred and fifty Ringgit per day, which is roughly $50 USD and we haven’t come close to spending that. Basically, how we were going to divide that is 50 Ringgit for accommodation, 50 for food expenses and 50 for activities. What we’ve been finding is that we haven’t been spending it so much on the activities. We’ve been doing a lot of free things around where ever we’ve been visiting. I would say our roughly daily expenditure is maybe more like 110 or 120 Ringgit. What this has allowed us to get typically is our own private room with air conditioning most of the time, a fan and typically a shared bathroom. It is not posh accommodations by any stretch but comfortable enough. Everywhere we’ve gone we’ve had wifi – some has been excellent and some has been not so good. For food typically we’ve been having (eating) local style restaurants. Restaurants that are frequented mostly by locals and we’ve been eating a lot of street food. We’ve been eating really well since we’ve been coming here. If you had Malaysia to do all over again what would you have done differently? Well, I would have liked to have spent more time at the beaches either in the Perentian Islands or maybe Langkawi. But because of the time of year the Perhentian islands weren’t really that accessible and Langkawi just turned out to be really expensive and apparently the wifi connections weren’t going to be that great over there. We would have needed that to get our work done. Beach time didn’t happen. No, beach time for the bunny. There will be more beach time in the next country. It is goodbye Malaysia and what are we up to next time week? Hello, Cambodia. We’re flying to Phnom Penh in just a couple of days and we’re looking at spending roughly a month in Cambodia as well. 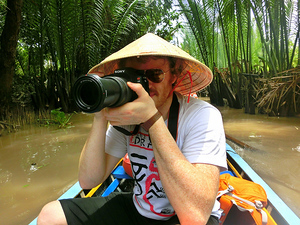 What you have to look forward to is a series of videos from our travels all over Cambodia. It looks like we’re going to be starting at the beach. Yes, beach time! To make somebody very happy. Yes, excellent! Alright, see you in Cambodia! Bye! Excellent timing. We just decided today that Malaysia is going to be our next destination and so thanks for the tips! I’m really looking forward to it now. I spent 2 separate months in Malaysia and thoroughly enjoyed myself. I stayed in bukit bingtang on both occasions. The food courts in the shopping centres in the bukit bingtang area are really good value for money and you have lots of choice. My favourite place was probably Georgetown Penang, with Langkawi (because it’s duty free :)) coming in a close second and we got motorbikes and drove around the island. Your write about the wifi connections.